Ya’ll know that I have celebrity crushes. Well… I have yet another one. I’ve got a crush on Chris Hardwick. Well, he’s the founder of Nerdist. Ummm… I’m not sure we can be friends. He’s helping people see that nerds can come in many different forms. They aren’t just the stereotypical pocket protector wearing/Star Wars quoting/D&D playing people. Nerdism (is that a word?) is about being super passionate (maybe even slightly obsessive) about something, anything. Nerds like to learn about their passion. They also spend a lot of time feeding their passion, whether it be video games, graphic design, or *ahem* food. I love this concept of nerdism. I am on Team Chris, all the way. Sorry Matt and Jonah. And now for some other important stuff. Made with cookies AND blueberries. Whisk eggs in a large bowl for a minute of two, until light and fluffy. Slowly whisk in sugar, a ¼ cup at a time. After all sugar has been added, whisk thoroughly for another minute. Stir in heavy cream and milk. Pour 1 cup of cream mixture into a small bowl. Add blueberry sauce and whisk thoroughly. Add blueberry mixture back into the rest of the cream mixture. Pour mixture into bowl of an ice cream maker and freeze according to manufacturer’s instructions. About 2-3 minutes before ice cream is done churning, add cookie pieces. Transfer to ice cream container and freeze for at least 4 hours before serving. *If you are hesitant to use regular raw eggs, feel free to use pasteurized eggs. Take half of the blueberries, mash them until desired consistency and set aside. Heat water and sugar over medium high heat, stirring occasionally until sugar has completely dissolved. Add all blueberries, vanilla and lemon juice. Reduce heat to medium low and cook for about 3 minutes, stirring occasionally. Remove from heat and let cool before serving. This entry was posted in Food and Drink, Geekin' Out, Shiny Stuff and tagged blueberry ice cream, celebrity crush, Chris Hardwick, Course of The Force, Doctor Who, Jonah Ray, Matt Mira, Nerdist, nerds, recipe. Bookmark the permalink. Yum!! 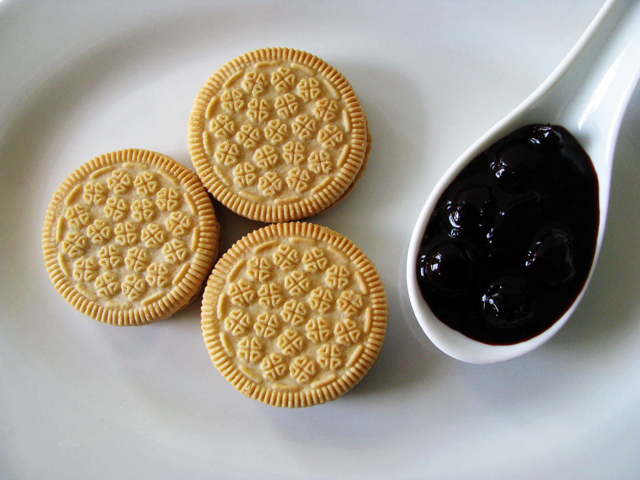 love blueberry and the addition of thos cookies is a great idea! 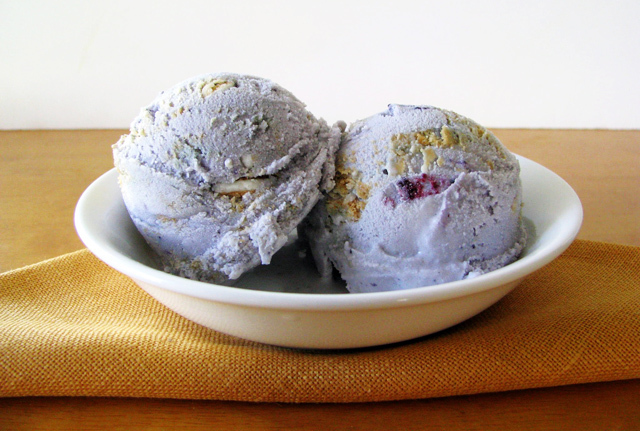 I totally want to make ube ice cream later. I just have to find ube powder or some actual ube.